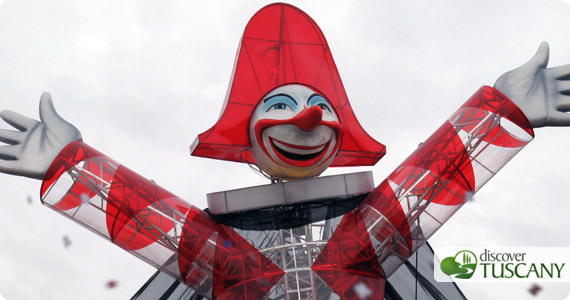 In a few days the famous Carnival of Viareggio 2010 will begin. The carnival in Viareggio is one of the greatest masked parades in Italy. The official calendar for this year’s carnival is: 31st of January, 7th and 14th of February (Sundays), 16th of February (Tuesday) and 21th of February (Sunday). The parade starts at 3.00 p.m. (and at 5.00 p.m. on the 21st of February). Every Saturday before the carnival in Piazza Mazzini and at the Natural Commercial Center you’ll find entertainers, artists and music for both adults and children. The Viareggio Carnival is really spectacular both for all ages. One of its unique characteristics are the giant Carnival floats in paper mache, even 20 meters tall, that parade along the seaside avenues of Viareggio, known as La Passeggiata of Corso Mazzini. These giant carts are built over several months, hard work that follows the ancient technique of the construction of sailing ships. Viareggio is known around the world for its workmanship in realizing sailing ships and yachts.The paper mache carts are different every year and take inspiration from various areas of life, from politics to current events and more general events (for example, last year the winning cart was related to the theme of immigration). There are also many figures which remind us of several Italian politicians. Some newspapers reported that this year some masks took inspiration from Micheal Jackson and Barack Obama. Most carnival floats also have singers and performers and music that encourage people in the audience to join in the parade. The allegorical floats are certainly the main attractions. At the end of the celebrations, the carts are voted and awarded prizes. Every year more than 800.000 visitors attend the Viareggio Carnival and as you can imagine the city becomes quite crowded. During the days of celebration it is hard to move around the city. You can park your car in especially reserved parking areas. We however recommend to take the train. The train station is just 10-15 minutes walking from the seaside avenue and you avoid getting stuck in traffic at the end of the parade. We also have to say that parking isn’t very cheap. Entrance tickets can be purchased directly at the parade. Tickets costs 15 euro while children younger than 10 years old enter free of charge. A pass card for all 5 parades can be purchased for 25 euro. Don’t miss out the occasion to be children again: dress up and join in at the Carnival!